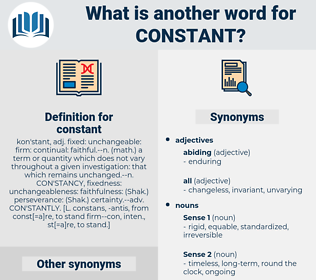 What is another word for constant? continual, incessant, ever-present, steadfast, ceaseless, perpetual, uninterrupted, unchanging, consistent, invariable, steady, ongoing, immutable, unceasing, unchangeable. permanent, relentless, recurrent, stable, lasting, enduring, standing, regular, unchanged, perennial, eternal, non-stop, tireless, static, endless, ever-increasing, fixed, never-ending, stationary, unabated, repeated, sustainable, consecutive, durable, long-standing, systematic, tenacious, round-the-clock, lifelong, everlasting, unbroken, indefatigable, stabilized, flat, undisputed, Recurring, continually, longstanding, stabilised, well-established, strenuous, successive, around-the-clock, long-lasting, solid, coherent, untiring, pervasive, staunch, unaltered, undiminished. institutions, Governments, challenges, minds, levels. persisting, lingering, shifting, appearing, enduring, ongoing, Recurring. continues, remains, describes, appears, requires, emerges. inconsistent, unsteady, disloyal, wobbly, discontinuous, changeable, interrupted, varying, infrequent, irregular, undetermined, Terminating, flagging, unstable, fluctuating, terminable, undecided, concluding, untrustworthy, temporary, broken, wavering, fickle, untrue, imbalanced, unfixed, stopping, changing, intermittent, different, ending. occasional, brief, finished, Ceasing, completed, Relenting, merciful, halting, transient, ephemeral, sympathetic. irresponsible, shaky, hesitant, transitory, faltering, uninterested, vacillating, unreliable, unexpected, dubious, phantasmagoric, kaleidoscopic, evanescent, apathetic, momentary, unusual, irresolute, dispassionate, noncontinuous, fleeting, undependable. It means this, that folks are in a constant worry, for fear you'll fall in love with Maddy Clyde. And they were in constant suspense about it. concatenate, coincident, consistent, constituent, Chinese Chestnut. coefficient, C, hubble parameter, Avogadro's Number, G, Avogadro Number, constant of proportionality, Hubble Constant, gravitational constant, speed of light, Hubble's Constant, universal gas constant, hubble's parameter, light speed, factor of proportionality, cosmological constant, constant of gravitation, R, equilibrium constant, Boltzmann's Constant, ionic charge, gas constant, universal gravitational constant.